Print out and shade in pictures of Hercules and Zeus. Find out about some other ancient Greek myths. Click on the arrow buttons to listen to the words. 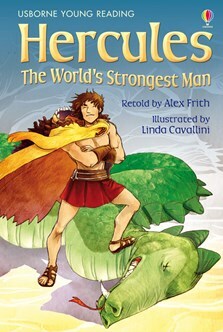 A retelling of the action-packed story of Hercules as he completes his most famous set of challenges: the Twelve Tasks. Aimed at children whose reading ability and confidence allows them to tackle longer and more complex stories. Developed in consultation with reading experts from Roehampton University. Part of the Usborne Reading Programme, now comprising over 250 books for children learning to read.